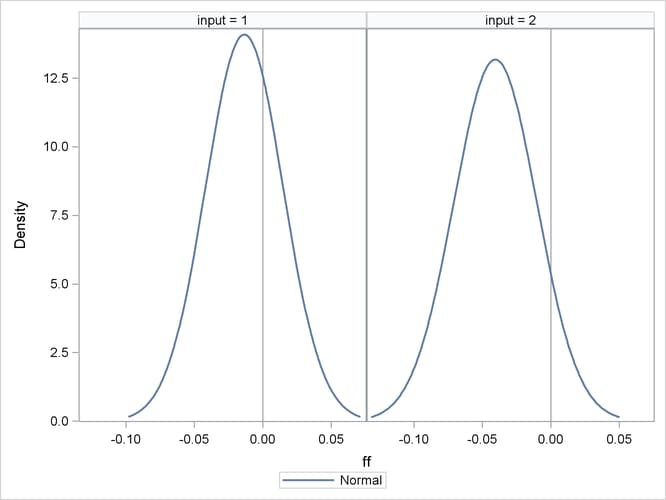 The following example illustrates the use of PROC SIMNORMAL to generate variable values conditioned on a set of related or correlated variables. Suppose you are given a sample of size 50 from ten normally distributed, correlated random variables, . The first five variables represent input variables for a chemical manufacturing process, and the last five are output variables. First, the data are input and the correlation structure is determined by using PROC CORR, as in the following statements. The results are shown in Figure 86.1. Although the distribution of these quantities could be determined theoretically, it is simpler to perform a conditional simulation by using PROC SIMNORMAL. Next, each of these conditioning observations is appended to a copy of the OUTP=OUTCOV data from the CORR procedure, as in the following statements. A new variable, INPUT, is added to distinguish the sets of input values. This variable is used as a BY variable in subsequent steps. Figure 86.2 shows the added observations. 1 COND 8.0000 10.5000 12.0000 13.5000 14.4000 . . . . .
2 COND 15.4000 13.7000 11.0000 7.9000 5.5000 . . . . .
You now run PROC SIMNORMAL, specifying the input data set and the VAR and COND variables. Note that you must specify a TYPE=COV or TYPE=CORR for the input data set. PROC CORR automatically assigns a TYPE=COV or TYPE=CORR attribute for the OUTP= data set. However, since the intermediate DATA steps that appended the _TYPE_=’COND’ observations turned off this attribute, an explicit TYPE=CORR in the DATA= option in the PROC SIMNORMAL statement is needed. The DATA step that follows the simulation computes the function ; in the following statements the UNIVARIATE procedure computes the simple statistics for this function for each set of conditioning input values. This is shown in Figure 86.3, and Figure 86.4 shows the distribution of the function values for each set of input values by using the SGPANEL procedure.